I know why you’re here. You can’t remember the last time you went to a cave that didn’t have the word ‘rave’ in front of it with a silent c. Never fear, your dreams of doing some authentically outdoorsy things in Sydney—or things that don’t directly involve wine—are about to come true. Got your map? Your hat? Your keen sense of adventure? Then you’re ready to cave! Let’s get the obvious out of the way first, shall we? Everyone knows the Jenolan Caves. You may have gone there on a family trip, school trip, or cheeky getaway at some point, in which case you’ll know exactly why they’re so flippin’ popular. It’s like another world under here, with glowing waters and seemingly never-ending caverns of wonder. If you haven’t gone, go. If you have, go again. Next. While we’re on the topic of the good ol’ Blueys, what about making a pit stop at Wind Cave? It will blow your mind and your eyes and probably your Insta feed when you upload pics. It took many, many years for this incredible feat of nature to form its intricate patterns and formations, so take your time getting to know it. The walk itself isn’t exactly a long one (and by that I mean it’s about 5 minutes), so consider killing two birds with one rock formation and combine it with another nearby cave on this list. 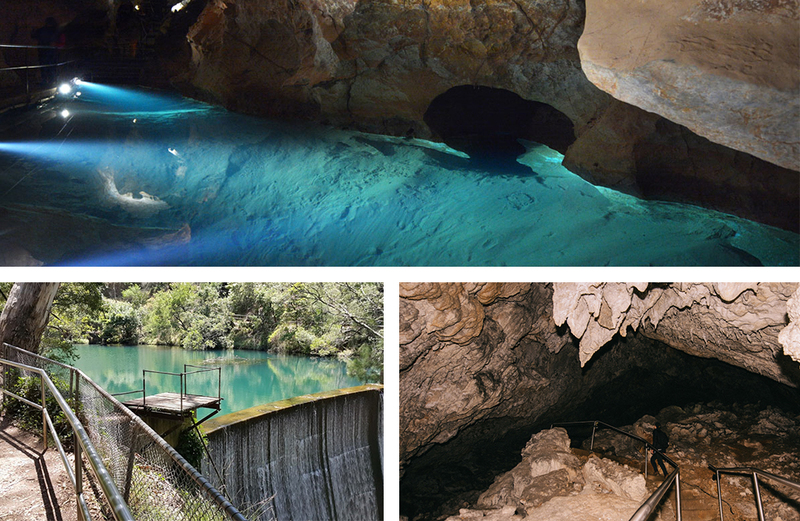 Kanning Cave is living proof that good things come to those that are patient and explore. That was crap. What I meant to say is the best part of this Kincumber cave requires you crawling through another part of the cave. It’s not an easy crawl, either, so only do it if you’re brave and curious. If you’re not (no shame in that), simply bask in the glory of the walk and enjoy cave numero uno. The walk to the cave is only 20 minutes, but with so much glorious Australian flora and fauna nearby, it’s a good opportunity to make use of PlantNet. Before writing this article, I usually referred to stalagmites and stalactites as ‘cave juice icicles’, but now that I know their proper names, I can inform you that it’s just what you’ll find in this wondrous place about two hours from inner Sydney. I won’t spoil things too much, but let’s just say if you like waterfalls, you’re going to love it here. Was that subtle enough? Caves are fun, and swimming is fun. Combine the two and you’ve got something of a bloody excellent day out. 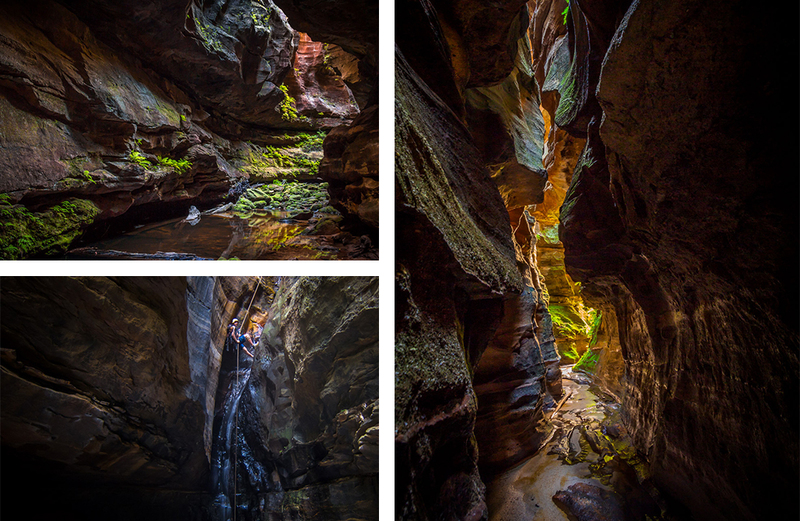 Full disclosure: it’s not proper swimming as it’s not deep enough, unless you’re super short, but wading through these formations near Lithgow is the perfect way to see something special in this great southern land of ours. *Rings bell* listen to me, friends. This is important. Things to know about Lake Macquarie’s Caves: It’s only accessible at low tide, unless you want to get yourself in a tricky situation like Kate Hudson in that godawful movie she did about treasure hunting. This place is amazing, but it’s pretty much neverending, so be sure to go in with a friend and have a clear plan of attack. Once you’ve got that covered, the world is your oyster. Or cave. The Southern Highlands aren’t just home to rich people with horses, oh no no. You’ll also find the stunning Fig Tree Cave hiding there. You could spend hours, nay, days exploring the incredible formations here. Not convinced? You drive a hard bargain, sir. Make your way to the Wombeyan Gorge and treat yourself a swim in this stunning body of water. Paradise, found. GLOW WORMS, Y’ALL! They’re one of those creatures (like that deep sea fish with the light on its head and Pauline Hanson) that you just have to look at and go “HOW did you come to be?? ?” If you share my sentiment, then hightail (geddit?) it down to the famous Glow Worm Tunnel, found just near Lithgow, where phones are banned and gaping is mandatory. This one is great for those that don’t have the time to be driving to the Blue Mountains, it will take you just under an hour to get there from inner Sydney. The walk is about 45 minutes if you don’t stop to look at things a lot, but you will, so add on at least half an hour. This magical cave is adorned with Aboriginal rock art, most notably ochre hand prints, thought to have been painted between 500 and 1600 years ago. If you have the time, we highly recommend continuing on with the Aboriginal Heritage walk, an extra 4km, afterwards. Full disclosure, this is less of an Aladdin-style cave of wonder and more of an incredibly enormous cave-like overhang situation that will shelter you from rain and falling leaves and maybe even your enemies if they’re lurking up top. You can camp here, too, so dust off your sleeping bag and brush up on your fireside stories. Looking for more epic things to do in Sydney? Head here.